At first glance this page seems happy and bright (just as I wanted it to be). But if you look deeper you will see the writing in black pencil. You may not be able to read it on the computer so I'll type what it says. And on the right it says 'It's sad that I feel I need to have Cheerleaders. I am always seeking other people's validation'. 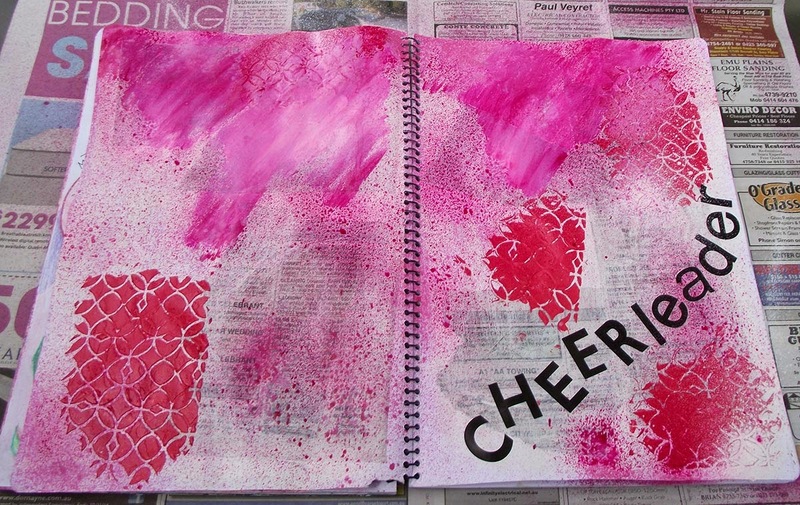 So if people flick through my journal they will see a happy bright page. If they want to know more about me and stop to read the text they will see what I was working through. My word for this year is 'Allow'. So I am going to allow myself to be what I am and share my pages. I saw another lovely page that read 'Give away your gifts'. So I think that is a more positive way of looking at what I do by putting my work on the internet for other people to see. And for that purpose. Here is my process. 1. Stick down newspaper. I wanted newspaper rather than book pages because new papers are all about spreading the word and circulating news. 2. I tinted some texture paste with red paint and pushed it through a Tim Holtz texture stencil. 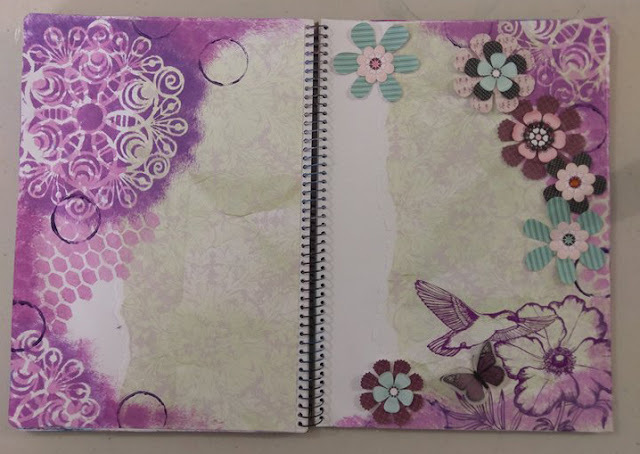 I also spread a little on the top of one page and pushed the stencil into it as I had seen done on other artists blogs. 3. 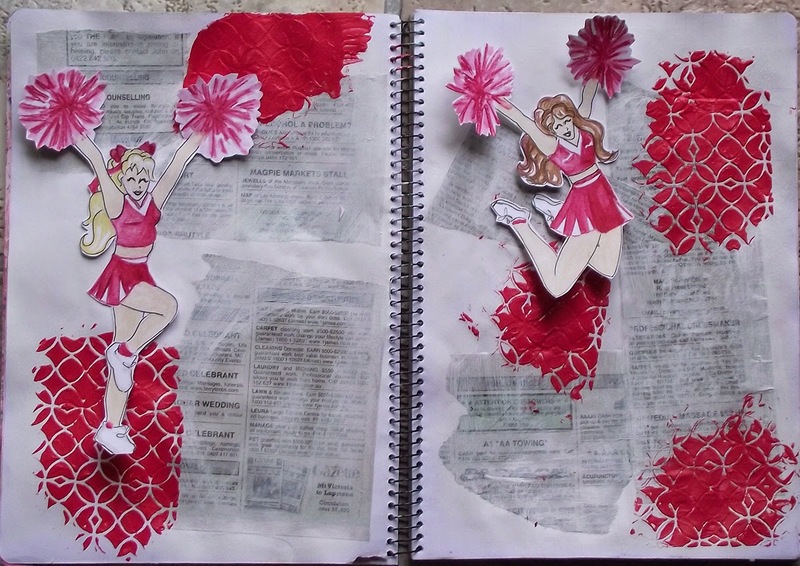 While my texture paste was drying I found some stock images of cheerleaders on the internet and drew them on white car, colouring them with watercolour pencils. Then I cut them out. 4. They aren't stuck on yet. I used black lettering stickers for the title. 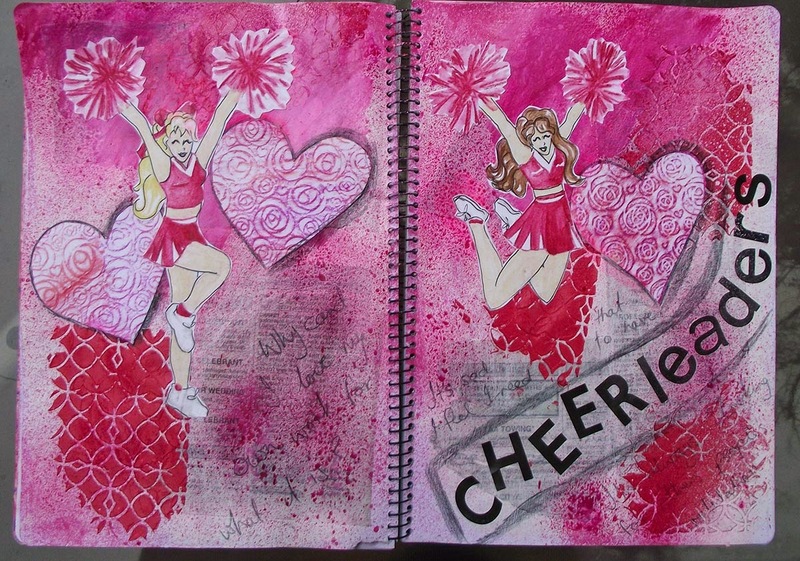 then I removed the cheerleaders and sprayed the background with red and white ink, smearing it where I wanted more colour blending. 5. I used an embossing folder and some plain white paper to create colourful paper which I then cut into heart shapes and glued to the page. 6. The last step was to go around the hearts and the title with a black pencil, and to stick on the cheerleaders. 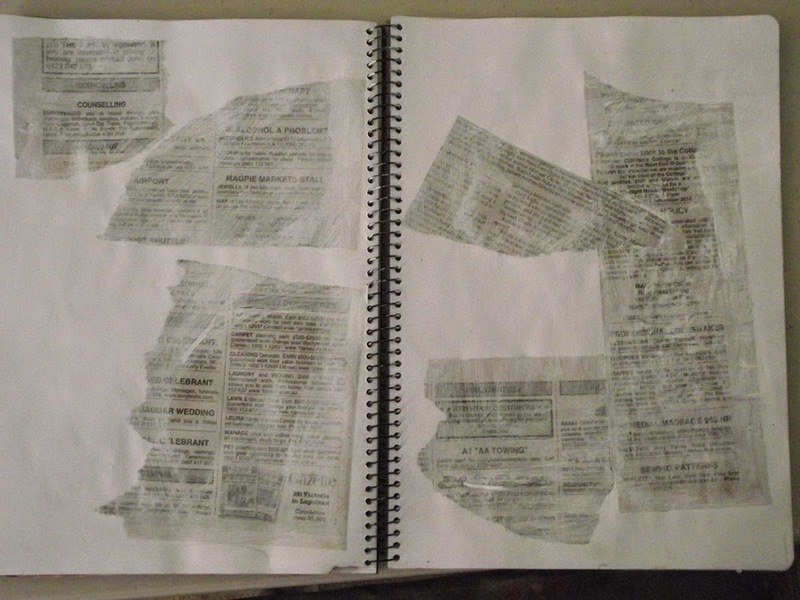 This took quite a bit of glue and holding them in place over the buckled background (I love my pages to be buckled). 7. I used a mat spray over the page to fix all the elements and left it to dry overnight to avoid pages sticking together. Thanks again to Brenda and her blog party. 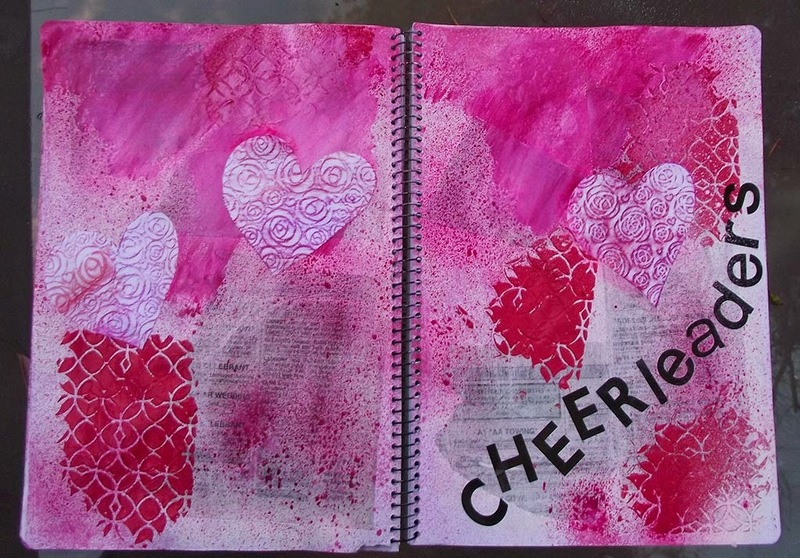 I can't get enough of art journalling and I visit almost every day to see what new pages have been posted. I am so glad you are allowing yourself to be you. 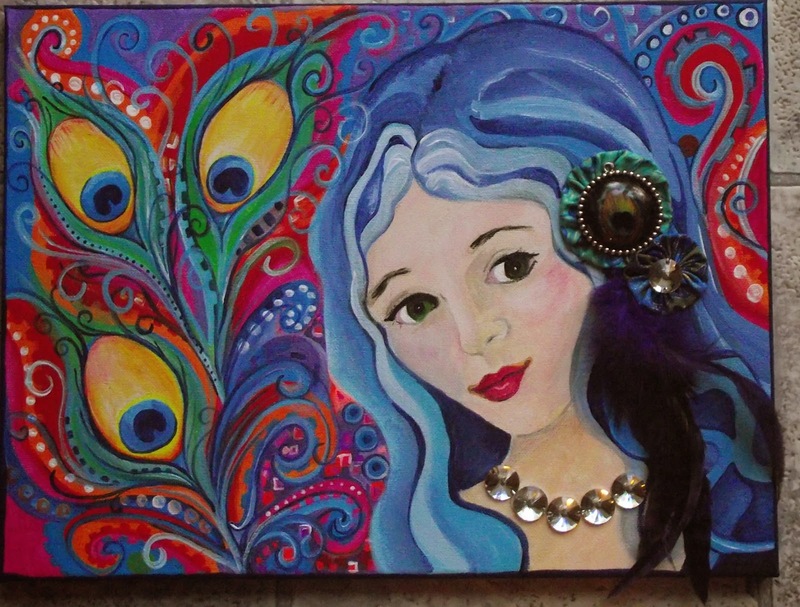 Whilst you are working through that tension inside of yourself you are creating some wonderful art and journalling. We all criticise ourselves and our art but learn to balance that by congratulating yourself too. Whilst want recognition and people to like what we do, your art is for you first and foremost - beauty is in the eye of the beholder. Looking forward to the next installment of wonderful pages on my visual journey posts. Thank you for visiting my blog and for becoming a follower, which led me to your blog. Your journal pages are just wonderful, and I love the fact you are allowing yourself to write on them. This is something I haven't done much of but your bravery is quite an inspiration to me. Thanks for sharing you step by step process. And thank you Krisha for following me right back. Writing is an important part of journalling for me. I aim for a deep meaning and to record where I am at. 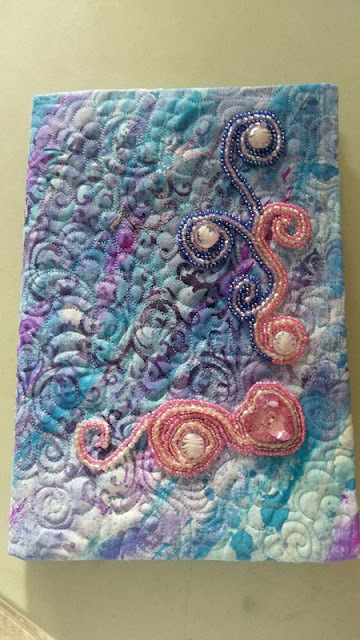 I concur with Brenda, and continue to do what you are doing, your journal is looking fantastic, always stick a positive thought on every page and it will all come together, when you look back you will understand. positive messages are important. But so are the issues that I dig into at times. It's all good ... all growth. I am smiling when I am looking at these amazing pages! Thank you for this! This is awesome!